At just under 80 minutes long, writer-director Paul Weisz’s Grandma is probably one of the briskest and easiest films to sit through all year. The overall premise is simple enough to follow, there are just the right amount of characters that make up the oddball supporting cast, and it moves itself from point A to point B at a reasonable pace that’s fast enough to get things moving and slow enough for the audience to catch its breath. What you might not expect, however, is the sheer weight of gender and sexuality politics it carries on its shoulders all throughout the movie, which makes this seemingly-light movie seem all the more heavier and complex when it’s stripped down for analysis. From the opening scene onwards, it’s clear that this will be a film which is dominated by genuinely tough female characters that are thankfully never defined by their gender, and are talking about some heavy topics that not many female characters in film would even talk about so openly. Abortion, for example, is perhaps the key topic up for discussion – teenager Sage (Julia Garner) initially approaches her grandmother Elle (Lily Tomlin) about her need for money to pay for an appointment that afternoon, and the rest of the film is just them trying to go around and get the right amount of cash neither of them have access to – but it’s also not the be-all end-all of what this movie is really about. If anything, it’s much more about the interactions between Elle and Sage and anyone else they happen to come across, whether it’s old flames like Judy Greer’s put-upon girlfriend and Sam Elliott’s amorous (and disappointingly moustache-less) ex-lover, or Nat Wolff’s irresponsible teenager (and the father of Sage’s unborn baby) or even a transgender tattoo artist played by Orange is the New Black’s Laverne Cox, and many more on top of that. The film manages to handle all those elements really well, and it ends up being rather impressively strung together when you realise that it’s all in a film that’s less than an hour and a half long. There’s not a moment that goes by where you feel that it was unnecessary or could have been cut out, it feels like just the right amount of time to tell this particular story and tackle these serious topics that should frankly be talked about more seriously in film. Weisz, here with his strongest film since About a Boy, allows his film to have a very carefree attitude that allows characters to come and go whenever they feel like they’ve served their purpose, but not in a lazy way like a lot of lesser filmmakers would probably go with. Their character moments all feel earned, and even in the space of just a short scene an actor and their character can really leave a mark on this slight but engaging story. Whether they’re just small roles like John Cho’s irritated coffee shop owner or slightly bigger ones like Elliott’s part or Marcia Gay Harden as Sage’s mother/Elle’s daughter who is probably the most (intentionally) monstrous character in the entire film, they’re enough to make their limited screen-time worthwhile. At the centre of it all are two very strong lead performances by Garner and especially Tomlin – the latter, most recently seen in the Netflix series Grace and Frankie, is on top form here as a woman who’s pretty much spending the entire day on the verge of a complete nervous breakdown, after breaking up with Greer in the first scene of the movie. It’s clear that her own anxieties are clashing greatly with her granddaughter’s slightly more urgent ones, and both Tomlin and Garner work so well off one another that their relationship feels unnervingly believable. Garner as well, after featured in bit parts in films like The Perks of Being a Wallflower and Sin City: A Dame to Kill For, is finally awarded with a spunky and meaty role for her patience, as a young girl who is placed in this bad situation but is no less determined to make the right choice for the sake of everyone around her in addition to herself. These are two good actresses working so well off one another that just hearing them talk about these pretty heavy things with each other or other people around them is more than enough reason to recommend this movie. The very definition of short and snappy, Grandma is a pure delight from start to finish. 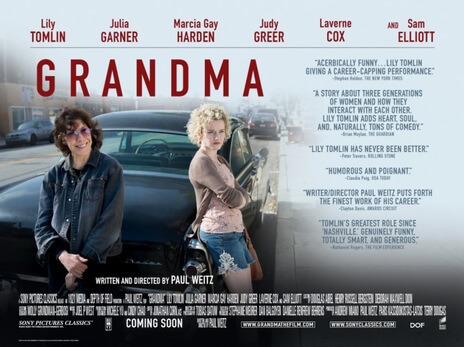 Grandma packs in a lot of satisfying character drama and insightful opinions on subjects like abortion into its short and snappy 79-minute running time, all of which is anchored by strong directing and writing by Paul Weisz and two great lead performances by Julia Garner and, most notably, Lily Tomlin as the titular matriarch.